First things first: I was named a 2015 Aspen Summer Words Fellow! What does this mean? That I get to attend the Aspen Words program for five days in Colorado this June, study with famous authors, soak in the brilliance of editors, and hang out with other writers. Excuse me, I mean NETWORK. (I'm pretty sure that's what adults call hanging out.) At any rate, I'm excited and grateful for this opportunity, and am already counting down the days. Such happy, welcome news in this writer's life. But enough about me - especially since last week was Nathan's birthday and the surprise I planned for him was a success! The day began with homemade chocolate cake and Shiner's Birthday Beer (their best one yet!). In the evening, we picked up our friends K and D and headed to the Top Secret location I'd warned Nathan about. He doesn't like surprises, but I got around that rule by telling him there would be a surprise so he could adequately prepare himself. Obviously he tried to figure out what the surprise was and came up with many creative possibilities - except for the one I'd planned. 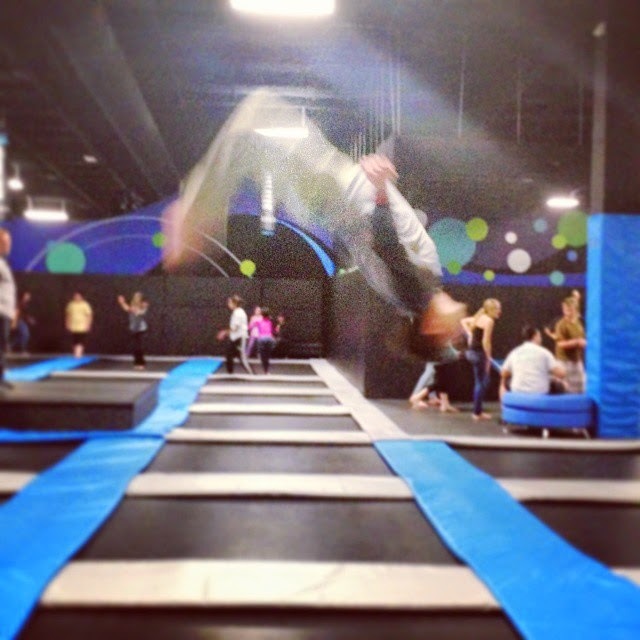 Defy Gravity, Wilmington's brand new trampoline park. SUCCESS. Once Nathan got over his shock and congratulated me on my successful surprise, we spent the rest of the night jumping, flipping, flopping, falling, and crashing into the 100 or so 10 year olds jumping around us. (Suffice to say we were the only ones there celebrating a 34th birthday party.) We signed up for an hour of jumping, without realizing quite how exhausting trampolining can be. Still, it was a great time and I'd like to go back, but maybe for Club Gravity, which is later in the evening and limited to people 15 and older. Thanks to Dory for this photo of Nathan mid flip! Besides becoming a Fellow and celebrating Nathan's birth, things have been pretty quiet in our corner of the world. Wilmington received its annual ice storm and my class was canceled on Tuesday, so that was nice. It was the push I needed to dive into another revision of my book (what can I say? I love revising) and rearrange our house. We moved our bedroom into the smaller guest room, since all we do in there is sleep. This allowed us to turn our larger bedroom into the dual office/guest room/TV room, which is so far working our very nicely. I guess ice is good for something. I hope your corner of the world is quiet, warm, happy, and productive. Speaking of productive, I better get back to work. More soon!